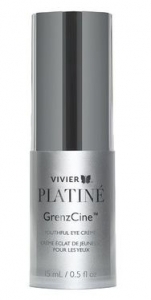 Introducing GrenzCine Eye cream from Vivier. Here’s the thing that makes it different from other eye creams: You can apply it to your mobile eyelid! If you tried that with most other effective eye creams, the cream would get into your eye and sting like the dickens. Trust me, I’m speaking from experience. As we age, the skin around our eyes gets thinner, more delicate, wrinkled and more transparent. Transparency appears as dark circles because the underlying blood vessels give a purplish cast to the skin. GrenzCine targets the layer of collagen in the upper layers of the dermis known as the Grenz Zone and makes it thicker. Thicker collagen means firmer skin and more opaque skin. I’ve been using it for about 3 weeks. I apply it right on my eyelid and in the inner corner of my eye where I can’t apply my regular eye cream. I have not had any problem with sore eyes. I really wish I had taken a Before picture. The inner corner of my eye, both upper and lower lids, tends to have very thin skin and look very purplish. I think that the purple colour is lessening and it seems like it is taking less and less concealer to brighten up that area. If you’re worried about thin and delicate eyelids or purple discoloration around your eyes, GrenzCine is the first product I have seen that is formulated to be used in those areas. Jaye and I are both trying it and we’re both happy with our results so far.